It’s time once again to join up with Cathy at Words and Herbs for her weekly take on the Tuesday view. I’ve missed a week with traveling but the rains have not, and 2017 continues to be a marvelously well watered and well behaved summer. 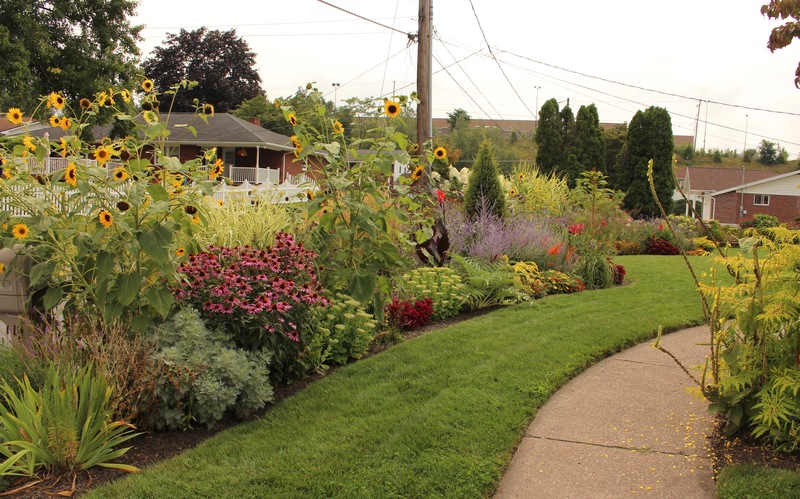 The front border continues to fill in and color up as summer progresses. The sunflowers are now in charge. It’s hard to believe that just a few months ago I wasn’t sure what exactly would be filling in the new sections of this bed. People said it would all come together but I had my doubts. Fortunately it did, and I’m very pleased with the results. Although they haven’t been in bloom very long there are already enough sunflower seeds to start bringing in the goldfinches. I love that they find so much to feed on in my garden and their bright yellow feathers and constant chatter are always welcome. A few unmulched spots of the older bed have sprouted a nice crop of the bright scarlet wands of standing cypress (Ipomopsis rubra). I would call self-seeding plants such as these ‘free’ volunteers, and the price tag of $0 needs no spousal pre-approval. 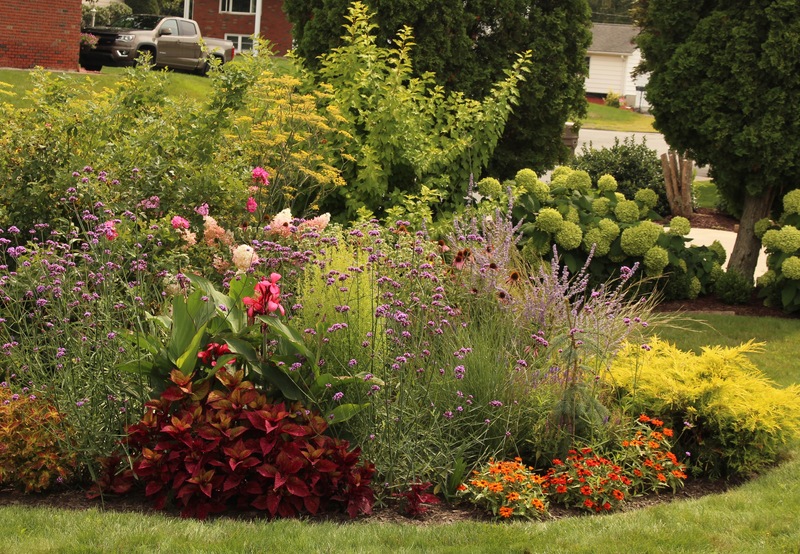 The bulk of this border either comes from established perennials which were already in place, or the divisions, cuttings, or seedlings of things I already had on hand. The depths of the bed interior are now a hopeless mess of colorful annuals mixed with reliable, veteran perennials. I haven’t even tried to get back there, the only attention it’s received has been a handful of fertilizer I threw in the general direction of the canna. Although my border does not do much in supporting the local nursery industry, it does seem to draw in the bugs. I sometimes just can’t believe how many bees, butterflies, and other insects can be found winging their way through this garden. It makes me sad for my neighbors and their dull seas of lawn. From the left, $0 for the sea holly which was grown from seed exchange seeds, $0 for the overwintered ‘cannova rose’ canna. 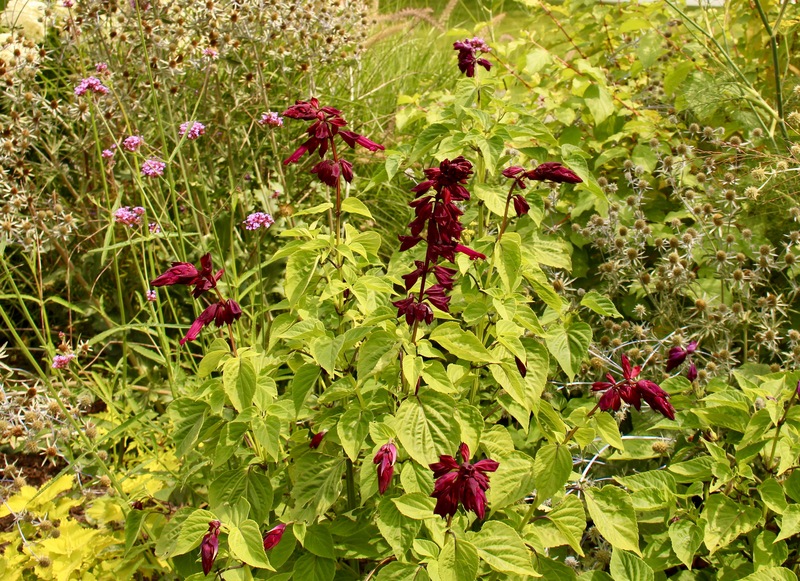 Free verbena bonariensis seedlings which were transplanted in, and free coleus grown from cuttings. So it looks like the bugs will keep this area as a ‘safe zone’ for a few more years yet. I guess I could do better with more and more bug-friendly plantings, but for now this works for me. My $0 monster cardoon. Grown from some seed exchange seeds it’s done better than I had hoped. I can’t even remember the other two seedlings which were planted just behind it. I’m out of buggy commentary and financially responsible planting advice. Lets just take a look at the bed’s far end. My second favorite view. $0 for Self seeded verbena bonariensis, $0 for coleus cutting, $0 for cannas. This spring I ripped everything out from around this dogwood. 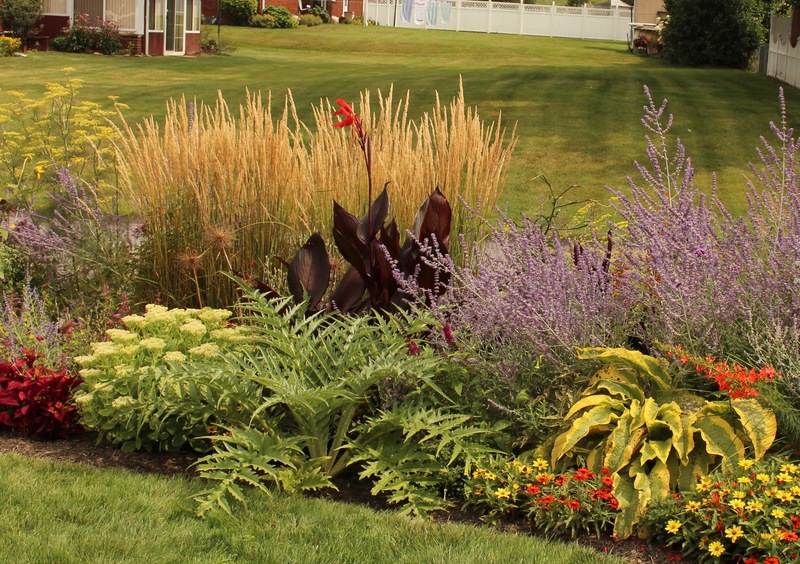 The hostas went to a good home but nothing else other than mulch came back in to replace them… until now. My caladiums finally have a summer home! Enjoy the week and as usual thanks go out to Cathy for hosting each Tuesday! 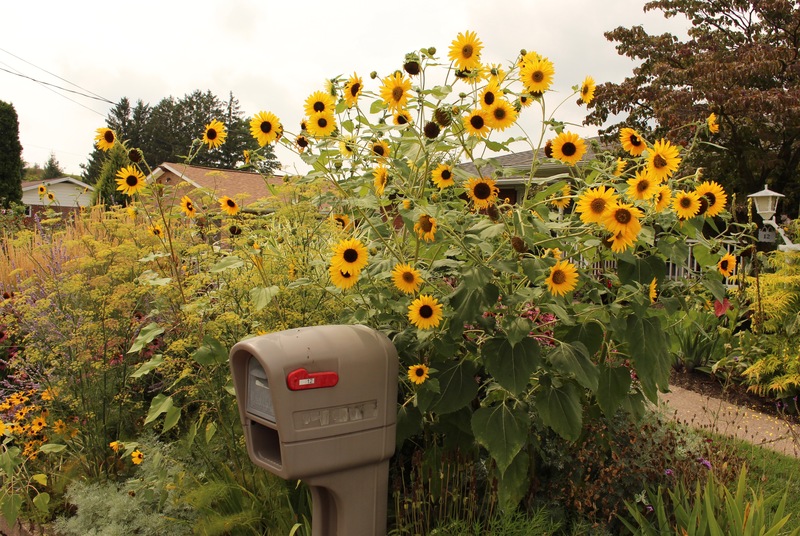 This entry was posted in Uncategorized and tagged flowers, perennials, Summer, Tuesday view. Your border is truly amazing! 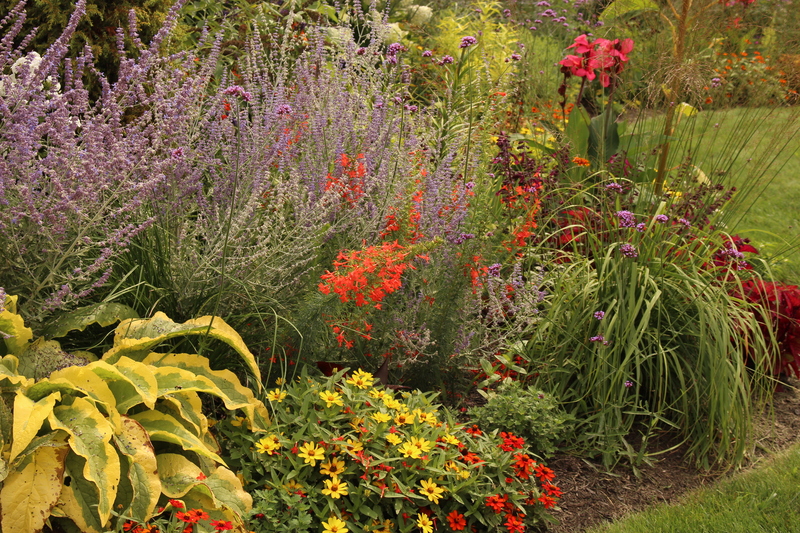 I love all the colours, shapes and textures, I would much rather be in your garden than your neighbour’s! Next door must be a desert for the wildlife, no wonder they all come to you! 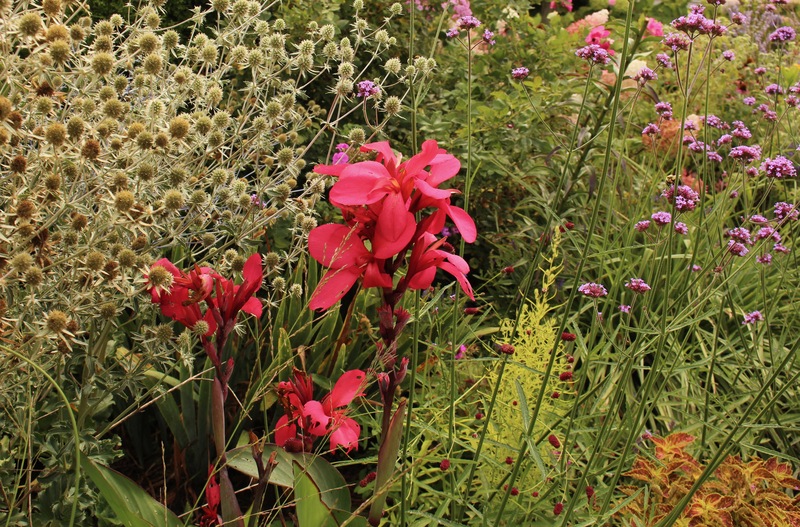 You have made a wonderful display out of your seeds and cuttings, your border just shows that we don’t need to spend a fortune to have a beautiful garden. 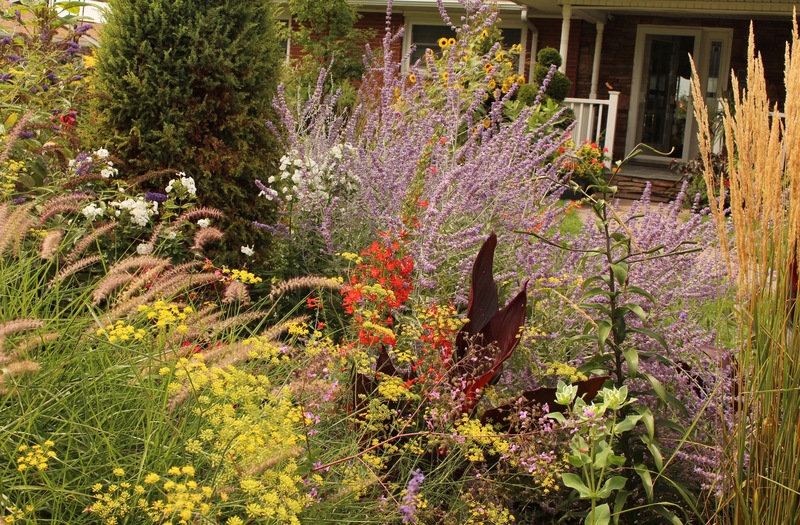 That border seems to be larger than ever with so many wonderful plants in it! You really have had the perfect summer it seems, and it all looks fantastic. 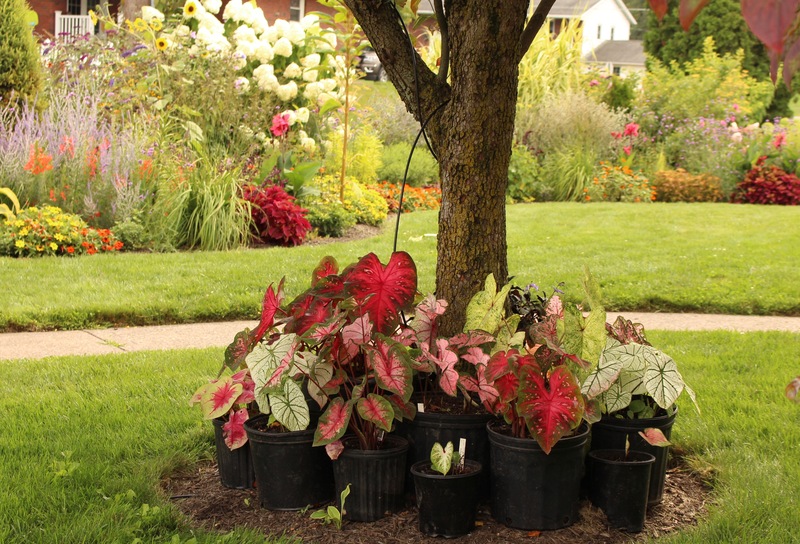 In that last photo you can almost hear the Caladiums thanking you for their new home! 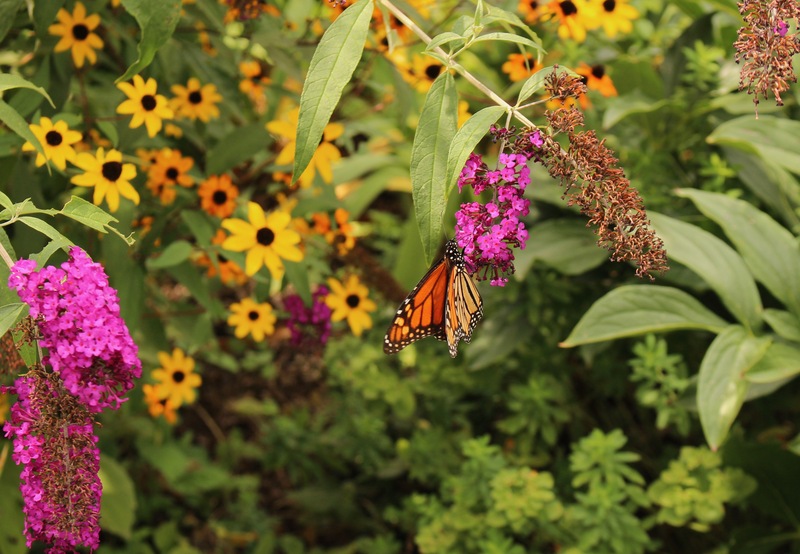 I know what you mean about bugs and butterflies… so many of my neighbours are worried solely about their lawns and still use various damaging chemicals to control weeds and pests. As to the costs, well I think a few dollars are definitely worth it for such a wonderful display, and it makes staying at home and sitting/dining in your own garden a great option compared with going away or eating out! 😉 And just think what some people spend on other hobbies and all the accessories they deem necessary! A friend told me what he spent on his latest pair of sneakers and it just made me want to go online and order a bunch of new plants… and I still wouldn’t compare! I wish you could come and see the garden. I’m 6 foot and the sunflowers, hydrangeas, fennel and grasses all loom over me. Looking back at photos from last year the plants look absolutely stunted! I’m trying to convert a neighbor here and there but it’s an uphill struggle. They just don’t get the worth in using less poisons or chemicals. My garden is not an organic one, but other than a little fertilizing and some annual application of pesticides for the daffodils and snowdrops, things work themselves out on their own. Your border looks like a million dollars that is why some are wondering about it. No matter what you used to construct it I and the bugs appreciate it. Your collection of caladiums are gorgeous. They look so tropical. I hope the caladiums still grow in a bunch. I love them too but was a little late in restarting the ones from last year, so they’re still on the small side. Your border filled in beautifully! Isn’t it amazing what a little summer rain can do? It’s looking grand. Can summer stay for a few months longer this year? If you can work out a longer summer let me know. I’m enjoying it far too much this year to want it to end! I keep trying to drop hints as to how I worry about pets and kids and putting down pesticides, how the lawn clippings are really just the fertilizer you just bought and put down… I’ve got nothing for lawn weeds though, but how can anyone risk killing off fireflies and butterflies? The goldfinches are here pretty much around the clock. It’s awesome, even my wife said the yard seems to be flourishing with life this year and I think there are still several weeks left. I may need to leave more sunflowers next year! I think things change as you gain gardening experience. Patience either grows… or disappears… or both! I have seedlings coming along which won’t amount to anything for years, yet I hear about a new plant and have to search high and low to get it NOW! Lots of intense color – that’s what I love. Plus the goldfinches feeding on sunflowers are always a joyful sight. The goldfinches are such acrobats, and hopefully as the season progresses there will be plenty of other birds as well. I think they’re still busy munching on insects rather than seeds right now. Verbena bonariensis just won’t reseed for me. I think it’s too wet here. And my cannas aren’t any taller than last year. One bloomed in a pot, the rest think they are still waiting for summer to arrive. I guess the humidity hasn’t convinced them! I only get verbena seedlings sprouting on bare ground, any mulch will keep them from coming up. I’m surprised you don’t even get a single one coming up! My cannas are on the short side even though I planted them earlier than ever this year. They’re just starting to put out flowers now and usually they’re earlier on that as well. you should try the cannova series they don’t seem to mind cooler weather as much as the others do. Frank, I always love this border but this year it is amazing!! Just shows what you can do with a little money and lots of enthusiasm and hard work. I love too how it all looks so natural. Thanks Christina. Isn’t it funny how you’re your own worst critic? I look at it and see so many faults and room for improvement. It’s colorful but lacks structure and design and hopefully someday I can work on that!